My first meeting with Master Nan was, like most of our contacts over the years, shaped by synchronicities. In the years following the first publication of “The 5th Discipline” in 1990, I had a growing feeling that I needed to find a teacher. With the success of the book, my life was changing and I knew I lacked a foundation for handling the attention starting to be directed toward me. I spent the better part of a year meeting different potential candidates. Feeling a little like Goldilocks, I had many interesting meetings but none that was right. This one was a bit too Western. This one a bit too psychological. This one a bit too esoteric. And on it went, until I started to wonder if I would ever find what I felt intuitively guided toward. Coincidentally, while my odyssey was unfolding, a good friend in Taiwan who I kept in touch with regularly, Showing Young, had found a Chan teacher. On a planned trip to Taiwan for a presentation in 1995, Showing excitedly told me that his teacher in Taiwan had arranged for me to see his teacher, who was in Hong Kong. So, at the end of a long and tiring visit to Taiwan, I flew to Hong Kong with Showing to meet this mysterious teacher, Nan Huai-Chin. Prior to the trip, Showing deluged me with information about this remarkable Chan master and his historic accomplishments. He took part in the resistance war against Japan, led troops, taught in the highest level military academy, and eventually came to Taiwan in February of 1949. A renowned master in all the major Chinese cultivation traditions, Taoist, Buddhist and Confucian, he was considered the most important Chan master of the past 400 years – not to mention a renowned expert on everything from traditional poetry to feng shui. After all this, when it came to finally make the short flight from Taipei to Hong Kong, I felt like I was going to meet the Pope. So, I was more than a bit surprised when the car from the airport drove us to an apartment building on Kennedy road and there, on the fourth floor, we entered an apartment with the television on and people milling around and talking. A small smiling gentleman welcomed me and said I looked exhausted and offered me a beer. In that instant, I knew I had found my teacher. That afternoon we talked and one of Master Nan’s students, Ken Pang, offered me a short meditation lesson in a side room. We then rejoined the group for dinner and I left for the airport, exhausted and completely energized. It was my first experience to the world of contradictions around Master Nan. Television and meditation. Rambling dinner conversations about the economy, politics and the stock market and dharma lessons. Face readers, jurists and accountants. All very relaxed and natural. It was my first introduction to the extraordinary flow and blending of opposites that I would come to understand embodied the traditional Chinese culture Master Nan was dedicated to preserving. 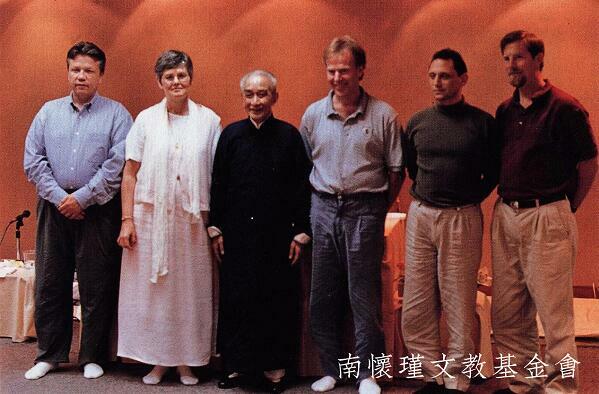 In June 1997, at my request, Master Nan hosted a week-long retreat in Hong Kong. As it turns out, the retreat occurred on the eve of the British “handover” of Hong Kong back to China. Most of the invited participants were long-time Chinese students of Master Nan’s. There were five of us from the West. But because of our presence, Master Nan organized a team of translators for the entire retreat. It may have been the first time this had been done, and it was of course a wonderful gesture on his part and great honor for we non-Chinese speakers. He was also in his early eighties by then and doing less lengthy retreats. This would turn out to be one of the last. It is impossible to summarize the experience of this first deep-dive into Master Nan as a teacher. He was with us for the entirety. He was brilliant, needless to say. He was a masterful storyteller, often bringing his accounts to life more by acting them out than just telling them. He was hilarious. One of the more memorable events was “joke night,” where everyone was invited to share favorite jokes. Many of the Chinese students, not having far to fall from their cushions, were literally rolling on the floor. It reached a point where translation was no longer possible. He was stern. At one point, he told us this was more like an “eating retreat” than a genuine Chan retreat given the amount of food that had been provided. For many of us from the West this was also our first exposure to the extraordinary depth and variety of Buddhist theory. For the first time, I began to appreciate twenty-five hundred years of exploration of the nature of mind, combined with the mutual influences that have shaped Buddhism through its interaction with different culture’s distinct cultivation traditions, resulting in a store of insights, frameworks, and practices that are simply overwhelming in their depth and breadth. As one monk expressed to me many years later, reflecting on the totality of the Buddhist Canon, the volumes of which fill an entire wall, “The bible is a very small book.” Master Nan did not teach Buddhism alone but revealed its distinctive unfolding within the Chinese context. He taught Buddhist sutras from a Taoist, energetic perspective and easily glided into Confucian texts and poems, as if all three traditions were like fingers of one hand - which to him they were. It was like having an expert gardener taking you on a personal tour through five thousand years of culture, as if he was showing you each plant he had cultivated and telling you their stories. Throughout it all, it was clear that Master Nan had little interest in teaching us like a university professor, but guided us as a co-explorer into an incredibly complicated territory that could never really be understood intellectually. It was clear that without commitment to your own cultivation practice, all the marvelous Buddhist theory was useless. But just so, relentless sitting on the cushion was also a dead end in and of itself. As thinking creatures, humans always interpret experience, and when the habitual thought patterns of the modern mind encounter the ineffable character of deep experience we seek to understand that which is not understandable. So, just as theory needs experience, experience needs theory - from the Greek theorea, ways of seeing. In classic Buddhist terms, this is the interdependence of practice and prajna, wisdom. Underpinning both is the deeper meaning of commitment to vows, which Nan said he rarely talked about because no one really wants to hear. “The grass would grow six feet in front of my hut if I explained what vows really mean - so few would ever come to hear.” And, indeed, he talked little of this in the retreat, filled as it was by his remarkable overview of Chinese cultivation theory and hours of sitting and walking meditation. I would not say this experience changed in any fundamental way the overall direction of my own work. Probably it was the opposite. Rather, it revealed more deeply what was there already. After all, we had always done a lot of work on personal vision, personal mastery and developing personal capacity to reflect on mental models. So, this emphasis on deeper personal work was there well before meeting Master Nan. But now it was situated within a far vaster territory of personal cultivation and wisdom teaching. Any question I might have had as to the importance of deep personal work to underpin larger scale change dissolved, and I found myself obsessed with the mysteries of cultivation the way most of the modern world is obsessed by technology, even though the connections between the two were far from evident at the time. There was also a new sense of starting to be able to relate our work to China and its extraordinary storehouse of wisdom teachings. In hindsight, I can see that, while tremendously inconvenient, finding the teacher I sought in China opened an unexpected new path. I began to think that our work, with roots clearly in the Western science of complexity and understanding systems, could offer a small but distinct contribution in connecting Chinese and Western ways of understanding. In this perilous time of transition, we face unprecedented social and ecological imbalances. We live on a global scale in ways that have no precedent, yet we have no clear underpinning of global values and guiding ideas. We tilt toward the fashions of local short-term reactive politics, yet have unleashed dynamics such as climate destabilization that will play out around the world over the coming centuries. None of this is sustainable. If we are to advance as a species, deep cultural changes are necessary. To realize these, we will need the best of all of us, East and West, North and South. In the ensuing years, my time with Master Nan awakened me to aspects of this I am still only beginning to grasp. I have pondered this last comment for many years, and I think it says something very distinctive about what the times call for today. But untangling the message requires exploring a few additional threads of our conversations over the years. Once, in one of our typical meanders through diverse topics, Master Nan pointed out that, “The human species is very young.” Of course, from an evolutionary perspective, this is clearly true. Whether we date the emergence of modern humans to 200,000 or 2 million years ago, we are still a very young species when compared with others of comparable intelligence like whales, dolphins or chimpanzees, most of whom have been around for 50 million years or so. Species come and ago. And although our collective ego may tell us we will last forever, there is no rational reason for this view. The human is a far-from-complete, evolutionary project. But, what is the nature of this evolutionary project – what does it mean to be a human being, really? Once, Master Nan asked me what was my own vision. To my own surprise, I found myself responding spontaneously, “To end the confusion.” Though I had never had this particular thought before, I realized this vision had been nurtured within me over many years in his presence. In that first Hong Kong retreat, I will never forget him commenting, in his inimitable way, almost off-handedly, “In the moment you die, you realize that your body was a hotel room you rented from your mother.” We live our lives confusing the hotel room and the occupant. Most often, we see ourselves as our bodies, our physical presence, what Master Nan called a“ third level of projection.” Sometimes, we see ourselves as our ‘persona,’ a sort of loose bundle of experiences, characteristics and beliefs. From a Buddhist theoretical perspective, both represent a mis-identification with a separate “self,” the first source of our suffering. Our awareness fills with thoughts and feelings. But that does not mean that “I am my thoughts.” Or, that “I am my feelings.” Letting go of these deeply habitual views of a separate self can be very disorienting. But, it can also lead to a very different sense of our own awareness – both more nebulous and more numinous. In the Yogacara school of Buddhism, immediate awareness is distinguished from comparative awareness. In the latter, we continually judge our experience in light of other experiences, like the meditator continually seeking experiences of quiet or particular states of samadhi. The problem is that logic cannot hold the experience of immediate awareness. It invariably analyzes and evaluates, and thereby obscures. It is like the hand grasping water. Immediate awareness is itself - without any labels, names or referents. A rose by any other name is still a rose. When this quality of awareness is brought to any experience, awareness is direct, unmediated by an assumed thinker or feeler. We all have momentary glimpses of this simple capacity for immediate awareness. But like the proverbial “blind cat catching dead rats,” most of us cannot access it reliably. Stabilizing this awareness is one basic aim of cultivation practice. In its absence, we continually reinforce the confusion regarding who I am. Perhaps, this is one risk of virtual reality. Given our underlying state of confusion, it would be easy to go from misidentifying with a physical body to misidentifying with a virtual one. As this happens, we would take one more, perhaps fatal, step in the long journey of separation of human and the larger natural world. And with that step, a potential evolutionary path might close forever. We glimpse this evolutionary path rarely, such as when we experience a profound connectedness with the larger natural world , but for most of us most of the time, this path remains largely invisible and sits in the background, a sort of undiscovered evolutionary heritage. This heritage is transmitted through many of the oldest cultivation traditions, such as the Taoist view of cultivation as an energetic phenomenon summarized in the familiar cycle jing-qi-shen-xu（vitality—life force—spiritual energy—nothingness）. In the Taoist tradition, like for many native peoples, this same ongoing energetic transformation operates continually throughout the living world. So, from this perspective, cultivating the self is inseparable from cultivating our connection with the larger living universe. It is impossible for me to imagine any sort of resolution of our immense social and ecological imbalances that does not pass across the threshold of reconnecting human and nature. As the Blackfoot Indians say, “Our first relationship is with Mother Earth. If that relationship is comprised, all our relationships will be compromised as well.” And this reconnection with nature is an inside job. But this “inside” is a vast and daunting territory. Nowhere is this more evident than in, the problem Master Nan saw with vows and why, as I said before, they are the third leg of the stool of Buddhist cultivation and yet he rarely talked about them. Why, if we sincerely seek to end suffering and the sources of suffering, do we so often act in ways that generate more suffering, for ourselves, others, and the world? (Indeed, this puzzle is not unique to Buddhism, as similar ideals exist in other religious traditions as well.) The key to the puzzle is that we have very little understanding of the nature of the commitment required. In Master Nan’s words, genuine commitment to vows demands a life-long journey to develop discipline in our “mental conduct.” This is immediate awareness brought to the moment-by-moment flow of our own thoughts and feelings - at all times, not just “when we sit.” It means seeing thoughts that do not reduce suffering as they arise and letting them go, and, in turn, seeing those that do and allowing them to grow. This is the grass that he said “would grow 6 feet in front of my hut.” The idea that we could develop such discipline challenges one of the deepest assumptions embedded in our modern externally oriented culture, that we have no choice over our own thoughts and feelings. For, deep down, despite all our technology and prowess in the external world, I believe we feel ourselves victims of our own minds, powerless to alter how they operate. We are estranged from the deeper dynamics of the inner world. Master Nan used to often kid me by saying, “Peter Senge wants to save the world.” This was correct, and probably still is. From my time as college student and my early years as a grad student at MIT, I had been immersed in the ecological challenges we face and felt that they, and how we rise to them, define this epoch - “Mankind’s final exam,” as Buckminster Fuller used to say. But as Master Nan once said, “The problems of collective karma cannot be solved by heroic individuals.” The shadow side of wanting to save the world is the ego of the hero who attempts to do so. So, I am still uncertain what the goal is. Today, it seems much closer to waking up than saving anything. Perhaps in the end, my time with Master Nan taught me that I do not need to know. The world does not need to be saved. It needs to be created. This is an extraordinary moment in history. China has stepped onto the world stage. But what China will it be? A Chinese version of a Western materialistic culture? Or a China that embodies and brings forward into today’s reality its extraordinary wisdom traditions? We all have a big stake in this question. Over the decade I had the good fortune to spend time with Master Nan, it became clear to me that his role was, at least in part, to help preserve awareness of those cultural roots during the extraordinary turmoil of the 20th Century. But the work is not done. For these wisdom traditions remain at odds with the modern worldview. As China continues to step forward, the forces to follow the materialistic Western path will be very strong, even as political correctness within China more openly criticizes the Western path. Pressures for profit and business growth are relentless. The allure of technology as the defining feature and driver of that growth is now deeply woven into all our societies. We all define progress by growth in GDP rather than by people’s well-being. Governments have come to define their role as protectors of business opportunity rather than shepherds of cultural evolution. The question of who we are and what our larger purpose may be within the web of living is all but lost to us. But, perhaps, not entirely. The very fact that people like Nan Huai-Chin have had and continue to have such an impact speaks clearly that we have not lost the “great hunger” for genuine spiritual growth. The Earth system is also speaking loudly to us - humans today use almost 1.5 Earths in terms of our footprint on the natural world. If China and India were to reach the level of material affluence and waste of the West, it would take 3 Earths. This will not happen. The path we are on has no future. As we proceed along it, we will produce ever greater ecological destruction and ever greater social inequity. The rich will get richer and the poor will get poorer, and many other species will suffer with us. We need, more than anything, new models. China could contribute to this. But not by continuing down the path of catching up with the West that has dominated the past decades. Nan Huai-Chin and his students are part of a different lineage, far older than the Industrial Age, technology-centric model. It is a model we all know deep in our hearts. And, it is a model that the larger living world fervently hopes we will rediscover.